Bailiwicks on Mill is a restaurant in Saint Johnsbury. Sporting a full bar, a beautiful dining room, and great outdoor seating – the food by far steals the show, and the service is incredible. Our choice to go to Bailiwicks was rewarded from the moment we walked in the door. I have to admit, I was a little worried when I saw the parking situation – as an old mill there are two small parking area on each side, the rest of the parking is done on the side of a narrow street. But, we were met at the door by a smiling Waiter, and by a hostess who quickly seated us on the deck. We arrived early, so I can’t say what the wait would have been had we come later, but the place seemed to fill up as we enjoyed our meal. The deck was beautiful. There is plenty of seating. Tables have comfortable, cushioned chairs and half the deck is covered by an awning. The deck runs along the entire riverside of the building, overlooking the mill pond and dam, giving a nice ambiance to the space. Inside, the history of the building shows. With exposed beams and remnants of the mill’s hardware, there is a romantic aspect to the dining room and bar. The two indoor spaces are separated by a glass wall that helps add light to an otherwise dark room. I was immediately pleased with the drink menu as well. Pages described offerings such as their list of bourbons and whiskeys, vodkas, and rums. Other pages listed inventive and classic cocktails, and their extensive wine lists offered by the glass, by the bottle, or by the half bottle options. I ordered an Almond Joy (coconut rum, amaretto, Kahlua, and cream) while my husband ordered a classic martini, and later he tried their Hot and Dirty Martini (absolute peppar, olive brine, and hot pepper stuffed olives). 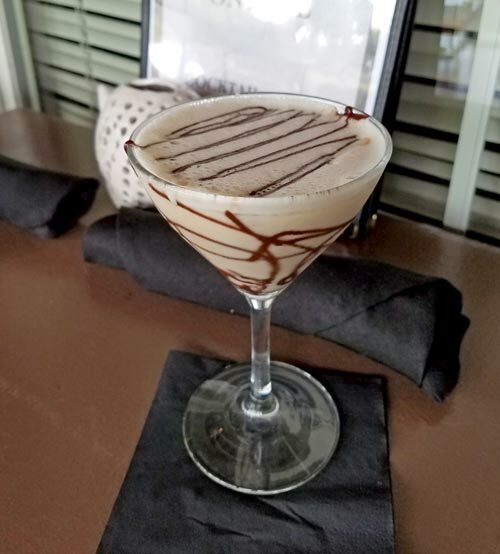 My cocktail was dessert in a glass – but it served as a great start to the meal. 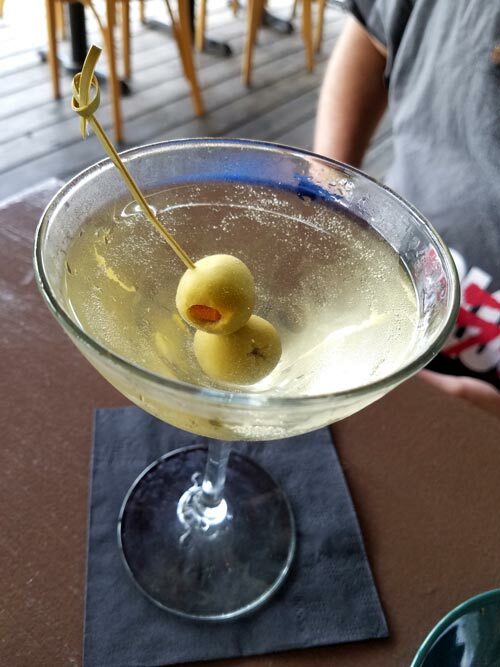 My husband was happy with his martini, though the Hot and Dirty was a little outside his flavor choice. I thought the cocktail was smooth with a peppery undertone, and lacking the aftertaste I associate with martinis. I gladly helped him drink it. To start the food portion of our meal, we ordered the Bacon and Malt muscles. This was a large bowl of seafood delights swimming in a beer, tomato sauce, and covered with fries drizzled with aioli. The sauce had a light bacon flavor, and the use of tomatoes was slight so they did not overpower the flavor. The muscles shined. 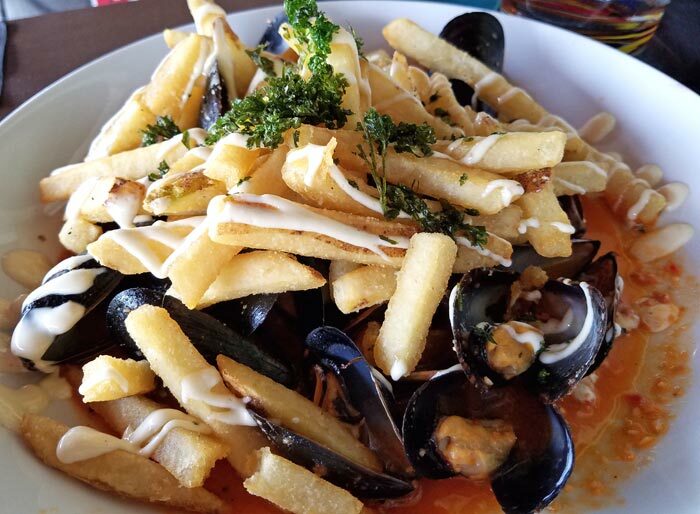 The sauce was a perfect pairing to the sweetness of the muscles. Adding fries was a great alternative to traditional bread as it added to the presentation and gave us something to sop up the sauce with. Both of our meals came with a choice of salad or soup. 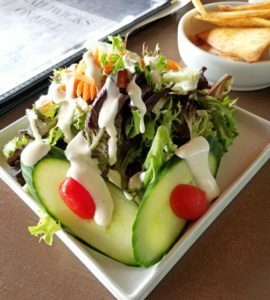 The day was much too warm for soup so we went with the gorgeous salads. These were larger than I was expecting. In fact, I was surprised by the portion size of all of the dishes we sampled. A pleasant surprise came after the salad. Our server brought us a dish with tortilla chips and a house made hummus made with artichoke, spinach, and onion. She explained that a hummus course is always served after the soup/salad course. It was delicious. The artichoke and spinach added freshness to the dish with a slight onion taste. At this point I knew I had to stop eating the hummus if I was to have any room for the meal. Dinner came, and I was delighted. 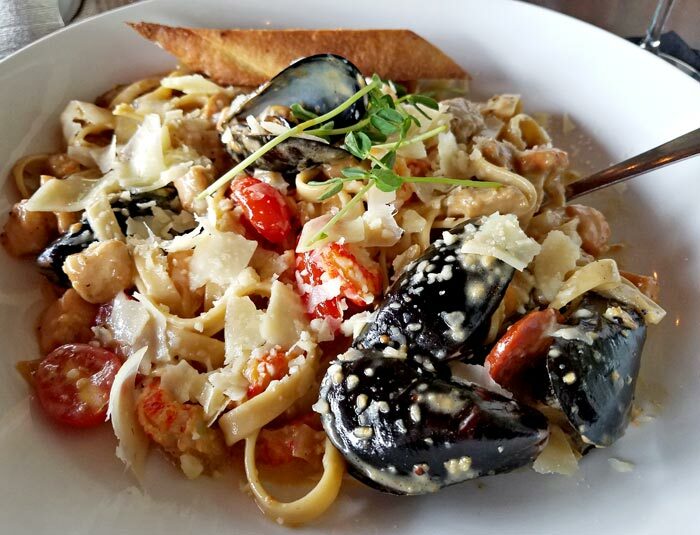 I ordered the Bayou Bowl – A combination of seafood, served in a spicy cream sauce over linguine. That night’s seafood combo included cod, salmon, muscles, crayfish, and sausage. I was blown away. First, all of the seafood was perfectly cooked; nothing was overdone or dry and rubbery. Second, the cream sauce was full of flavor. I could taste a range of spices before the heat kicked in. I will say the heat was a little much for me but I don’t normally do spicy. I powered through the heat though because I couldn’t stop eating it. I am very happy that I broke out of my comfort zone and gave it a try. My husband ordered the Kentucky Gentleman, a 14 oz. ribeye steak served with sautéed veggies and baby colored potatoes. The meat was cooked to a perfect medium rare, and was that melt in your mouth texture that is associated with the cut. Veggies were still crispy, and the potatoes were a wonderful spring addition. What really stood out to me about this restaurant beyond their unique location and beyond the stellar food that is a step above similar establishments, was the service. In Vermont’s Northeast Kingdom service is often friendly, but the air of sophistication, great training, efficiency and cohesiveness seen in city restaurants is often missing. That was not the case here. The staff was on top of their game. Tables had their orders taken promptly, drinks were kept full, and staff checked on their tables in an unobtrusive manner that almost went unnoticed until they were table-side when you needed them. A perfect example of this is when I was ready to order my wine. Our waitress hadn’t been to the table in a bit, but I had seen her come out onto the deck and check us a number of times. She had seen me put the menu down, and was soon at our table taking my drink order. Another aspect of this restaurant that I enjoyed was that it is unpretentious. Their food is top quality and beautifully plated, but the atmosphere is kid friendly and little touches like funny quotes on the menu, the names of the dishes, and even the décor make this restaurant feel relaxed and approachable. The prices are on the higher side for the region, with most entrees in the mid to high $20 range. 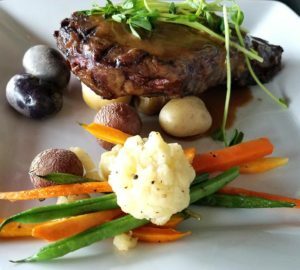 But, for the quality of food, the care taken with preparation, service, and the portion sizes – the price is well worth it. Overall, Bailiwick’s was one of the best dining experiences I have had in the Kingdom. I highly recommend it.